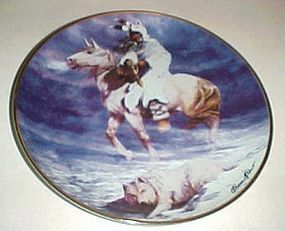 Spirit of the Winter Wind limited edition, hand numbered, native american collector plate. Authorized by the Western Heritage Museum. Plate is by artist Hermon Adams and distributed by the Franklin Mint. Limited edition plate is no longer available now through Franklin Mint. This has the original certificate but no box. Measures 8" and has gold trim. Perfect condition. A lovely Indian plate, and I have others to this series. See my catalog.